If you know who C.P.E. 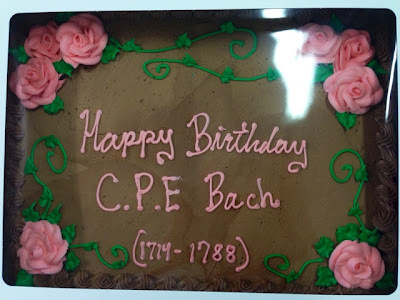 Bach is, bonus points for you. If you don't, know that he is a composer, and son of the more well-known J.S. Bach. My old church was doing a musical celebration for C.P.E. Bach's 300th birthday. I got an email awhile Bach from the music director at my old church, asking if I wanted to be apart of the instrument ensemble today. I emailed her Bach, she sent me the music, and we all got together today to perform it at church. There were two flutes, one cello, two violins, and the regular church choir. We all sat Bach behind the alter. Music was gorgeous. I have a hard time not appreciating music, regardless of the genre, especially when it's live. I'm going to be straight up honest here, I'm not religious. Sometimes I truly wish I was, though, because religions seem to make people so happy and full of hope. It gives them something to come Bach to at the end of the day. Bach when I was eight, I started going to Camp Calumet Lutheran camp for a couple weeks each summer. I was so convinced that I was going to become a counselor in training, and spend as much time at Calumet as I possibly could. This past summer was my last summer there. I could never bring myself to teach anybody anything that I don't truly believe in. There isn't much I can do about that. So I didn't really know what to say when people who recognized me, and said, "Hey, you're Bach! Welcome Bach! So nice to see you!" I didn't know if they though I was going to be coming to church regularly again or not. I just went with it and smiled and shook peoples' hands, ate some cake, tried to look and act my age, all that. It's nice to feel sophisticated and appreciated every now and then.